Hip pain can be caused by soft tissue problems around the hip joint in the muscles and tendons or due to problems within the joint itself. In addition, problems within the lower back can also be referred to the hip. Diagnosis of the source of the pain is essential in creating a treatment program to gain the best outcomes. The majority of soft tissue problems can be dealt with a targeted physiotherapy program, however, a certain number of conditions will benefit from keyhole surgery and physiotherapy. Such conditions are typically described as hip impingement (FAI) and labral tears. These can occur as a result of trauma or as the first/early signs of arthritis. Typically patients complain of pain when they bend their hip and twist at the same time. Accurate history and examination, with the use of other imaging such as MRI and CT scanning, help to determine if there is a suitable target for surgery and the physios. 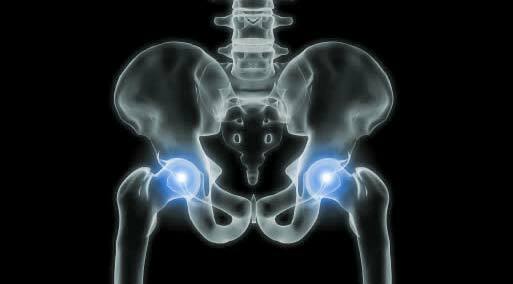 Once degenerative changes in the hip have progressed to a level at which they become significantly uncomfortable for a patient, keyhole surgery is of little benefit and unfortunately most painkillers begin to have less and less effect, this is when the time for joint replacement starts to be considered. Often, patients will find that their walking distance has become limited, you may begin to experience pain at night which wakes you from your sleep, you may also have increased difficulty putting on your socks or performing pedicure. Many describe a groin strain that came on without any trauma and never seems to go away. Unfortunately, once your pain and level of function reaches these levels, it is time to start considering whether joint replacement might be suitable. This decision is made after careful history and examination of yourself and also review of x-rays of the affected joint. "My knee replacement has been so successful that I regularly forget which knee has been operated on." We manage a range of knee conditions with the help of physiotherapists and sports therapists that include significant traumatic injuries to the cartilage and ligaments around the knee, through the degenerative cartilage tears that can occur in the early stages of arthritis to the development of full thickness cartilage loss and arthritis that might require joint replacement. Traumatic injuries to the knee can result in significant soft tissue damage. Careful history taking and accurate examination can accurately diagnose the injury that has been sustained in over ninety five per cent of cases. The use of further imaging such as MRI scanning helps to confirm the injuries that have been sustained and identify any other additional problems. A large percentage of soft tissue injuries around the knee can be managed without any surgical intervention. They often require the use of supports, strapping and potentially, bracing whilst the injury settles alongside supportive therapies to help regain the range of motion and stability in the joint as soon as it is deemed sensible to start. Unfortunately, some injuries such as anterior cruciate ligament rupture (ACL), meniscal tear, meniscal detachment and, more rarely, a collateral and posterior cruciate ligament injuries (PCL), will require surgical reconstruction. The vast majority of these can be performed with keyhole surgery including cruciate ligament reconstruction. Unfortunately, once the degenerative change in the knee has progressed to a level at which preserving surgery is not possible, the next option is to consider joint replacement. This is typically once the pain is no longer manageable with simple painkillers, patients start to find that their walking distance is limited and they are getting pain that wakes them from their sleep most nights.